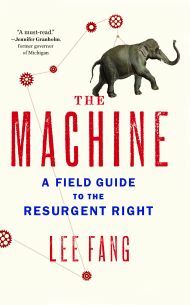 INTERVIEW: Lee Fang talks about his book “The Machine: A Field Guide to the Resurgent Right” & corporatist influence in the U.S. NOTE: This is part two of a two-part post on Lee Fang’s new book “The Machine: A Field Guide to the Resurgent Right”. My review of the book can be found HERE. After reading Lee Fang’s new book The Machine, I was interested in asking some questions about his research and his thoughts on a number of issues related to the rise of the corporatist conservative movement that so dominates our politics and our government today. I spoke with him on Saturday and our conversation ranged from the beliefs of the average Tea Party adherent to what the left is doing wrong in the battle for public opinion. I just want to say what a great book The Machine is, so well-researched. How long has the research been going on for you for this book? Well, when I was working for Think Progress, things that didn’t work out for the blog, I would save in a large Word document. It just go so long that, when I started talking to the publisher, I said, “Well, I’ve done all this research that I haven’t published, that just hasn’t worked out for the blog…” So I spent another six months adding to what I already had and it just came together really well. So, we’re talking, what, five years? Six years? Longer? Oh, no. Probably more like two years. It seems like you got incredible access to events — Tea Party events and conservative events, stuff like that — how did that work? How were you able to get into these events? For all the criticism of the Tea Party, one thing that they’ve done really well is that they have been open and they have been accessible. I have been kicked out or told that I’m not welcome at a couple of these events but, for the most part, it’s been pretty easy to go to events, be open about who I am, and walk around and talk to folks. That’s interesting. That actually bodes well for me here in Michigan if I cover these types of things. Yeah, you really ought to. I think more people should because documenting some of this is really important. It’s not just about what they say but how these events are set up, what goes on, what’s their agenda, it’s important. My experience with it is that the people who are sort of what I would call “grassroots” people or the everyday people that attend these things are really are unaware of where the funding comes from and how their set up to begin with. They vigorously fight back against any criticism of it being “astroturfing” and stuff. Do you see that? Did you find that that was the case, as well? That’s exactly right. You know, I like hanging out with fully grassroots Tea Party activists because, for the most part, whatever their motivations are, they’re just upset about society and they want to do something about it which, at the core, I respect even though I pretty much disagree with their worldview [laughs]. But, you know, it’s good to talk to those folks. They have the same sort of anxieties and concerns at a base level that I think a lot of people on the left have. So I think talking to those people and seeing how these corporate operatives or these astroturf groups manipulate that is really interesting because they’re taking what I think are some shared values — worries about “Is government working for us?”, “Why is society breaking down?”, “Why are we losing all these jobs?” — and they’re manipulating them in such a way that they’re having an impact on the policy process. But seeing how that process goes forth is really interesting to me. So do you think that when you’re having an ideological debate with someone on the right that explaining to them or helping them to understand that they ARE being manipulated is a useful way to approach the conversation? You know, it’s hard. Things are just so polarized. I don’t try to talk to people about that. When I go to these events, I’m usually just talking to people about what their concerns are. Sometimes I’ll ask them, “What do you think about the fact that this wealthy guy, David Koch or whomever, and he’s just asking for you to call for a repeal of the estate tax because it will benefit him?” People are concerned about that but I think they’ve been listening to so much Fox News and Glenn Beck that their automatic response is “George Soros!” or something like that. Something reflexive. One of the things that really struck me as I was reading your book was how just about every element that you talk about, whether its the infiltration of media or the impact of ALEC or the State Policy Network (SPN) think tanks — any of this stuff — every one of those things is being applied in Michigan in profound and obvious ways. I’m wondering how unique Michigan is in that regard. Are we unique here or is this happening in every state or in all of the major battleground states? Americans for Prosperity and the State Policy Network affiliate the Mackinac Center, they’ve been in Michigan a little earlier than in some of these other states. So I think that’s a little unique there. You see activity in states where there are super active wealthy people. So you guys have the DeVos family and I think they’ve been a motivating factor because they give so much money to these types of organizations. But, look, at the end of the day, Michigan is not unique because this is going on everywhere. But, if you look at states like North Carolina and Missouri — in Missouri they’ve got the Sinquest family that’s heavily funding these groups and in North Carolina you have Art Pope who’s obsessed with funding these groups. So, in certain states where you’ve got families that are obsessed with this type of thing, you see more activity. But, what’s going on in Michigan is not particularly unique. I guess it’s good to know that. I don’t feel quite so alone! What’s remarkable to me is really how little of an investment they need to make. I mean, to set up a Tea Party group, get them a website and a few resources, that doesn’t take that much money and then it can begin to have this really profound effect. The Tea Party in Michigan, especially the Tea Party of Western Michigan, which is in the conservative west part of the state, they’ve had a really huge impact on making sure that Medicaid expansion doesn’t happen in this state. You know, I think that’s one of the key take-aways from this book and I’m glad you’re talking about that. The left spends a lot of money on politics and advocacy but a lot of it is on issue silos like getting more money to food banks or helping immigrants and that kind of very isolated, very nonpartisan, very non-ideological stuff. Advocacy is very important, it has a direct benefit to regular human beings that need that, but there’s not that kind of funding to this sort of broad, permanent campaign political structure that really has the potential to shape the entire state or entire country. I think the Tea Party has demonstrated that you don’t need too much money to have a huge impact. I mean look at what American Majority is doing. They’re going out and they’re organizing folks, they’re hiring, they’ve got something like two dozen people going out and training people to go online, make lots of screen names, mess with liberal websites, go on Amazon and give one star to liberal books… That’s not expensive to do but that’s how people view the world these days and being able to manipulate things… I’m not advocating this strategy, I’m just giving it as an example. You can change public opinion which then changes public policy by doing these sorts of very strategic things that the left just doesn’t do for a whole variety of reasons. So you’re saying they’re not being efficient in how they’re spending their money. They’re spending money in ways that aren’t effective over the long term in regards to the things you’re talking about like changing public policy. That’s an interesting observation. Yeah. And they’re kind of obsessed with doing good and doing things to help people who need it immediately for one particular issue area. There isn’t this sort of long term strategic plan that the right is obsessed with. And, you know, for all their failings, they’ve been able to implement these strategies in ways that show a LOT of foresight. What are your thoughts on the impact of term limits in terms of all of this? In Michigan for example, lawmakers can only run for six years total, three terms. I’m seeing that … I’m in a little bit of a tussle right now with a Democrat that sort of set me up, telling me that some legislation had been stolen from him by a Republican when it turns out that he had actually cadged that from previous legislative sessions from Republicans. To me, a lot of this is because he’s just kind of a novice and he’s not very seasoned as a politician. So when you’ve got term limits and you’ve got fresh people coming in all the time, they become more susceptible to being manipulated by these sorts of corporate front groups who are always there. Do you see that happening? There are a lot of organizations who aren’t as sinister as ALEC — NCOS, all these other groups — they come in and provide template legislation because, simply put, state lawmakers don’t have the time or the resources to write their own legislation or to analyze what’s going on in the local economy or for whatever type of issue. So, when you have a temporary legislature where folks are coming who are insurance salesmen or mortgage brokers, this isn’t their full-time career. And they know they’re going to be leaving in just two or three cycles, so this isn’t something they’re going to be studying for every night. And this opens up a huge opportunity for “professionals” to come in. These are the former lawmakers who are now lobbyists, these are the front groups, these are the lobbyist-backed groups like ALEC and they just come in and provide these types of resources to get these sort of things passed because lawmakers just don’t have the time. Term limits just makes this problem so much more acute because people don’t take it seriously. They come in their and they don’t have the resources and they don’t have the expertise. Its just exploited by these groups ruthlessly. I hear the criticism that it’s the staffers who are sort of the continuum between the different legislators but it goes beyond that, it seems to me. Is that happening on the left, too? Are left groups providing legislation in the same sort of scope as the right is? I don’t think it’s the same scope but, of course, they do. Unions provide template legislation. Lobbyists across the board provide legislation. But, there’s this sort of fundamental imbalance that’s present in every aspect of politics. A lot of these progressive groups are trying the same sort of tactics but they just don’t have the resources that right has. A union, for example, can come in and propose a bill but do they have the money to 24-hour radio advertisements and television advertisements? Do they have the money to bus people? Do they have the think tank network to provide the academic cache? No, right? So, they do provide the legislation but they don’t have the resources to see them through. That’s one of the really profound things that I got out of your book. I think that’s the overarching theme: how “holistic” the corporatists are in terms of just hitting everything. They don’t leave any stone unturned or any path untraveled to get their message out and to get their policies in place. The structure of The Machine is to show all of these different ways of influencing policy and they hit ALL of them and they do it very effectively because they have a history of doing it to teach them how do it properly. That’s right. And I hope that people start thinking about campaign finance in a completely different way. I mean, people are talking about should have publicly-financed elections and how do we deal with all of these super PACs and money to candidates? But, really, that’s just one spoke in the wheel. Let’s say we had public financing and candidates didn’t have to beg donors for money. That would solve a lot of problems but it wouldn’t solve the entire crisis that we have in America today. Let’s just say we had public financing — let’s play a thought experiment — and politicians didn’t have to beg. Well, look, the coal industry can still fund constant issue advertising that doesn’t mention the candidate’s name on CNN and on public television every day. They can still fund think tanks. They can still buy public opinion. And they can still do the sort of PR efforts that are necessary to pass bills and the type of lobbying, the grassroots efforts, the organizing. Obviously it would be a tremendous benefit if candidates didn’t have to be so obsessed with begging for special interest money. But, you have to look at all of these issues holistically. I don’t think these “good government” types have thought of a solution for this. I don’t have a solution for this, either! If you’re a low-income person or if you’re someone who’s concerned about the environment, if you’re someone who is living downstream or down-wind from a factory or a refinery that’s polluting, you don’t have the resources to fund a candidate. Well, that’s not you’re only problem. You’ve got to have a think tank and a grassroots organizing institute and these types of publicity efforts to really influence the public policy process. It’s not enough to get a candidate on your side just in terms of donating to them. It’s so much bigger than that. That’s pretty profound. Transparency laws play a role in that, I think, but frankly just informing people who is funding this stuff isn’t enough to turn people away from it. I think sometimes that people don’t care too much who’s funding it as long as it sort of touching the right spots in their brain to make them feel good about supporting it. Yeah, exactly. People are busy. I mean, you’re a great example of someone who is a complete aberration because you have a full-time job and you’re still doing all of this and you’re looking at things carefully. But if someone is working a 9-to-5 or even two jobs, how do you evaluate all of this information? It’s really difficult even for me and I do this professionally. But, it’s so easy to hide the money and, even if there is disclosure, you’ve gotta take care of your kids, you’ve got to pay the mortgage. How do you really discern, especially with these very sophisticated propaganda efforts from the right? They’re like this alphabet soup of so many different names that sound academic, that sound credible but they inundate folks. I don’t blame them, really, for being fooled sometimes. I think if you talk to the average Tea Party person, they don’t really care if it’s corporate money that’s funding all of this stuff because they’ve done a really clever job of making people feel like they’re getting their needs addressed by it. They don’t care who is funding it if their issues are being talked about. Transparency doesn’t solve that issue. Exactly. Americans for Prosperity is a great example of a group that is so corporate-backed. It has this long history of doing whatever its corporate backers and what it’s wealthy backers have told it to do. It’s such a selfish way of manipulating public policy. But they use such populist rhetoric that it’s easy to get enthralled in what they’re saying. They’re going out and using the kind of populist rhetoric that you’d expect from a Marxist, right? Or some sort of socialist rally in the 30s! What’s interesting is that the president of Americans for Prosperty, Tim Phillips, his dad was a populist Roosevelt Democrat. His name was Franklin Delano Phillips — he was actually named after FDR. And Tim Phillips grew up in this populist Democratic household. He didn’t share the same political views but he uses the type of populism that really gave us the New Deal and the Great Society but for a completely different end. That’s incredible. You know, in some ways I see your book as much as a history book as anything else. It’s really telling full story that’s not being told in any one place. I think it’s going to go down as a book that told the history of our current situation and I think that’s a great benefit. One of the things that I’ve been seeing a little bit lately is religious right groups taking on issues that aren’t really the mainstay of those sorts of groups. The American Family Association, for example, is starting to promote anti-union stuff. I’m wondering if the shift from conservatives from using the religious right as their power base or financial base over more to corporations has got them trying to get back in the game. Are you seeing that elsewhere in the country at all? You know that’s a really interesting question and it deserves a lot more investigation so I don’t have a ready answer for you. But, you see a lot of these organizations that have faded over time and they need money. If you’re an organization with credibility with a certain audience group and you’re working with the right PR firm in D.C. — you know, you go to Edelman, you’re go to Burson-Marsteller — you can find someone to fund you to get out their message if you’ve got an audience that listens to you. An example of this is, one of the great left wing grassroots organizations from like the 50s and 60s, Americans for Democratic Action, they’ve become a shell. You know, they ran out of money two decades ago, they just sort of sit there and exist. But they’ve got a big mailing list and some loyal followers. Two years ago, my buddy Mike Elk exposed that they were working with these for-profit colleges, these colleges that don’t want regulations but they get all this taxpayer money — you know, University of Phoenix, what have you — and they started taking money from these for-profit colleges and going out and saying, “You don’t need any regulation on the for-profit college industry.” Just really bizarre stuff that has nothing to do with their 50-year history of being advocates for low income groups. You see this dynamic across the board. Ralph Reed, the former head of the Christian Coalition, now he has this new Christian group, I believe the Faith and Freedom Coalition, and this is all he does. He goes out to corporations and he says, “Pay me, I’ve got a ready set audience of loyal evangelical followers and I can use them to support your cause.” He’s got his own PR/lobbying firm that he uses to move the money around and pay himself, I suppose. So this is a dynamic that goes on across the board. I don’t know exactly what’s going on with the Family Research Council or Focus on the Family but it wouldn’t surprise me if there’s a similar dynamic. It’ll be interesting to watch that. That’s something I want to pay more attention to. It was really remarkable to see this sudden change from a homophobic, anti-LGBT group suddenly getting involved with union stuff. It sort of rang a bell with me. And the fact that they’re dropping by a left wing blog and openly dropping comments in the comment section is very interesting to me. That IS interesting and something worth looking into. The Machine: A Field Guide to the Resurgent Right can be purchased HERE.